1. Hover effects are not pixel perfect - hovering on the arrows creates issues because they appear to be triangles but occupy a square region. So hovering/clicking at the edge of a link could trigger the event on the next/previous link actually. 2. You cannot use gradients on borders which means you are stuck with flat colored breadcrumb links. 3. You cannot animate the links along with the arrows using CSS3 transitions. The solution is to use rotated squares lying half inside the link and half outside giving a triangular shape - not just in appearance but also in functionality. But positioning rotated squares is a tedious task because the dimensions are all out of control. Hence we apply some math to scale down the rotated squares to occupy the same height as the links so that positioning them becomes easy. (More explanation on this in the code/walkthrough). 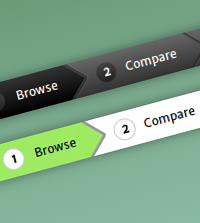 This tutorial also uses CSS Counters to number the breadcrumb links. The first breadcrumb displays the use of gradients for the links whereas the second demo uses flat colors along with transitioned hover effects for the navigation. Just an FYI. You misspelled ‘awful’ as ‘aweful’ in your introductory paragraph. I thought you’d want know to know. Otherwise, great tutorial. Bitchin’. When people ask me what I do for a living, or at least part of it, I should just send them this link. Mind you, my skills are not quite at this level. I agree with Rick! That was a very impressive demo.Thanks! THX a million for your very useful and beautyful tutorials, ruby_on_rails!! Simply lovin’ it!! Genius! Amazing job and thanks for sharing. Hate to be a bummer… but it seems that Safari still isn’t supporting transitions on pseudo elements. So in your second example I’m seeing the rounded, rotated square change colour instantly and the rest play catch-up. You didn’t make a claim on cross-browser perfection or anything so it might not matter but I thought I’d just let you know what I saw just in case! Cool, but this has nothing to do with breadcrumbs of course. Call it wizard nav, step indicator or whatever, but a breadcrumb is an entirely different component. Thanks,it helps me alot. can i download those videos. HI. It is simple awesome. One small suggestion is It is not working in Internet Explorer. How to implement same breadcrumbs for the html structure like this? Thanks for your nice breadcrumb!! Hi, Can you help in retaining the tabs position on page reload.